Woody lives with his grandmother and longs for his family to be reunited. His charismatic Uncle Vincent (Common) has just returned home after years in prison, determined to straighten out his life. One morning, instead of dropping Woody off at school, Vincent decides to give the boy a tutorial on how a man gets things done. Woody jumps at the chance to join his father figure for the day. Their time together quickly changes from optimistic to desperate as Vincent’s plan to open a restaurant is crushed and his past life of crime comes back to haunt him. "A strong debut, and evidence that Mr. Candis can have a long and fruitful career as a director." 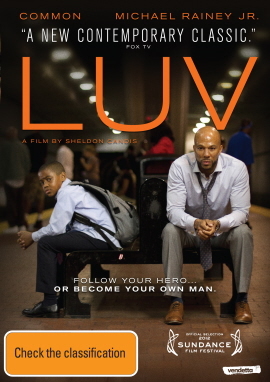 "Luv' shows the kind of heart and intelligence that is always welcome — and often missing — in American movies."